elsewhere. “We have to be realistic about where our fees are going,” said Gaal. But all questions from the audience about vague proposals listed in both the president candidate’s platforms were answered flawlessly with both candidates clarifying exactly what they intend to do and more importantly how they plan to do it. 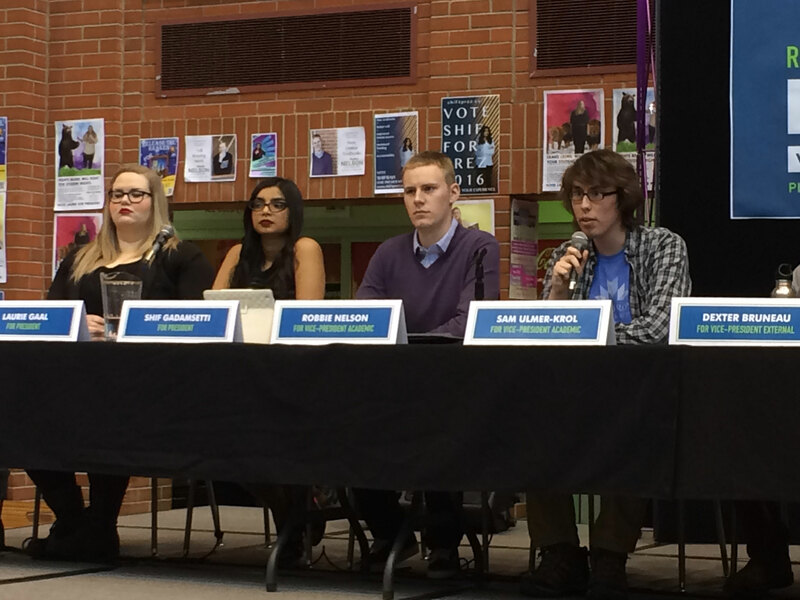 This speculatively close and competitive race between Shif and Laurie wasn’t lost on the other candidates including first time candidate for the vice-president of student life position Isabelle Sinclair. “I think this is a really competitive batch of people and I think that especially between Shif and Laurie, they both really want it, and I think it shows they’ve done their research and they’ve done their work because they want it so bad because they want to be a voice for students and I think that’s how I feel and how all of us feel,” said Sinclair. Vice-president academic candidates Robbie Nelson and Sam Ulmer-Krol also seemed well prepared and engaged in academic issues particularly student evaluations of instruction (SEIs). The topic of SEI confidentiality issues was discussed with Ulmer-Krol even going so far as to say “Negative, sexist, hateful comments will not be tolerated.” But both failed to mention programs or courses they want introduced. This omission stuck out for student Pri Dutt. Dexter Bruneau is the only candidate for the vice-president external position and answered questions about transit issues, mental health and how he wants to bring back more arts and culture into MRU. With the most candidates, the vice-president of student life position will be a tough call with three qualified people vying for the spot. Valerie Caden-Baptiste, Madelaine McCracken and Isabelle Sinclair have all been involved with a variety of MRU programs and resources and have varying perspectives because of this. 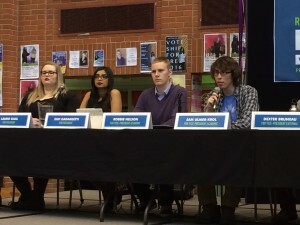 But when the topic of the Pride Centre possibly closing was brought up the three candidates were unanimous in their resolve that this would not happen due to the integral and invaluable position they feel the Pride Centre fills at MRU. So MRU, get out and vote. 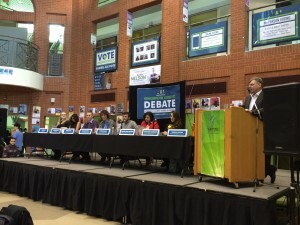 Your voice matters and it is clear from this debate that no matter who is elected there will be strong, engaged and motivated people creating a better MRU community. 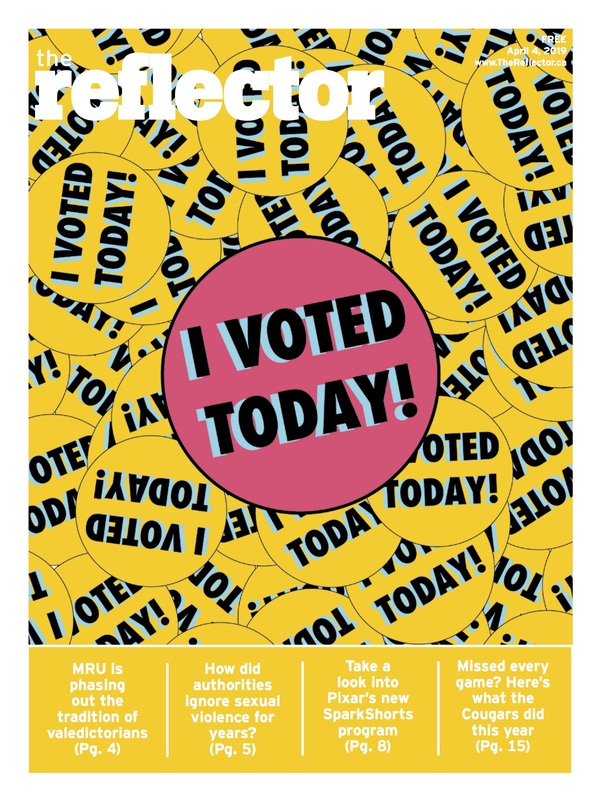 Voting is now online @http://www.samru.ca/vote/voting/ as well as in person booths will be set up Monday, Tuesday and Wednesday at both the East and West Gate entrances.